A huge and awesome expo, general buzz in the city and media coverage about the race throughout the weekend, fantastic hospitality from my local hosts Shankar and Vidya, perfect weather conditions, 32000+ (mostly) fast runners, 1m+ wildly cheering spectators , numerous interesting placards along the way, the scream tunnel at Wellesley, comfortable first 25Kms, the tough battle of the hills in the last 17 Kms, the emotionally charged up crowds as we entered Boston and the joy of meeting family members a few minutes after crossing the finish line pretty much sums up my fantastic experience at the 118th Boston marathon on 21st April. My finish time of 3:50:57 , though within a minute of my worst case target(race preview here) , was my slowest of the 3 FMs this season and well over 13 minutes my PB. I was extremely thrilled with achieving the goal that I have been focused on for nearly 3 years: BQ'ing first in October 2012 and again in January 2013, successfully making it to the entry list in September 2013 and then running the venerable race itself last month. However, I would say,for me, the journey itself was more satisfying and exhilarating than the end. 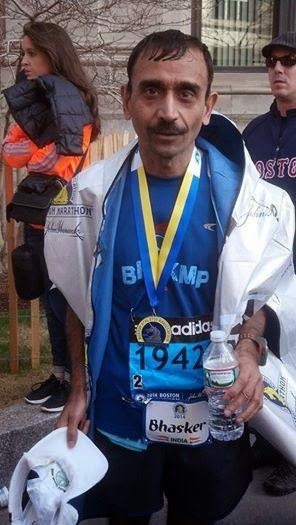 While running in the oldest and iconic marathon was a great experience, personally I would consider beating my qualifying time by 2 minutes 40 seconds in SCMM 2013 the pinnacle of my marathon running career(I doubt if I would ever be able to go below the 3:37:20 time - I hope to at least do a sub 3:40 one more time!). And the excitement and high on the night of 25th September 2013 on receiving the acceptance e-mail from BAA was far more than crossing the finish line on 21st April 2014!! The five weeks leading up to the race was very hectic - with travel and personal and professional work. After leaving Bangalore on 31st March while I managed to put in most of training runs I got in just one cross training(cycling) workout in the last 3 weeks before the race and virtually no strengthening. The last two long runs - a 13 miler in Croydon, UK on 6th August and a 10 miler in Southbury, CT on 13th August did not go as per plan - one due to inclement weather and the other due to hilly terrain. As a result on race day I weighed about 60 Kgs/132 lbs - 4-5 Kgs more than my optimal race weight! The build up of nervousness and excitement started from the Atlanta airport on 19th morning as I waited for my connecting flight after catching a red-eye flight from San Jose. 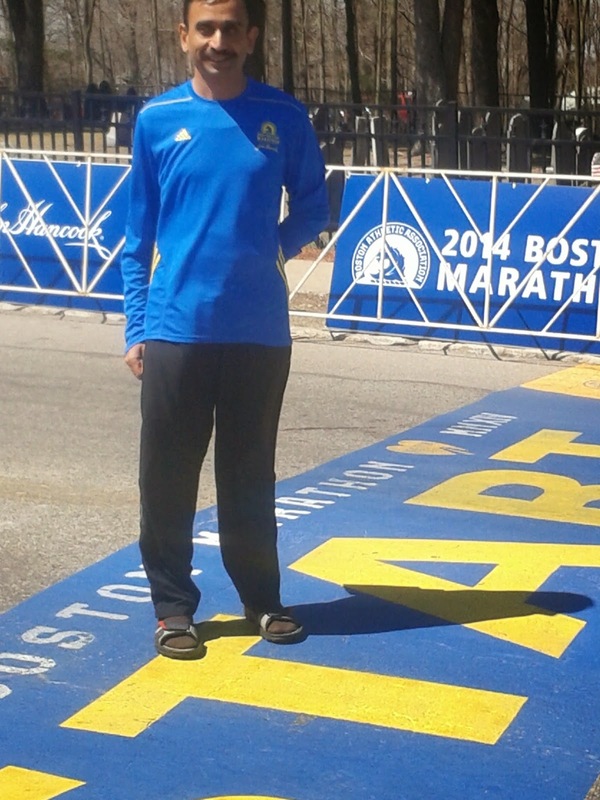 There were numerous runners on the flight many wearing a T-shirt or jersey from a previous years' Boston marathon. I even spotted a runner with a T-shirt stating that she had taken the Boston to Big Sur challenge. 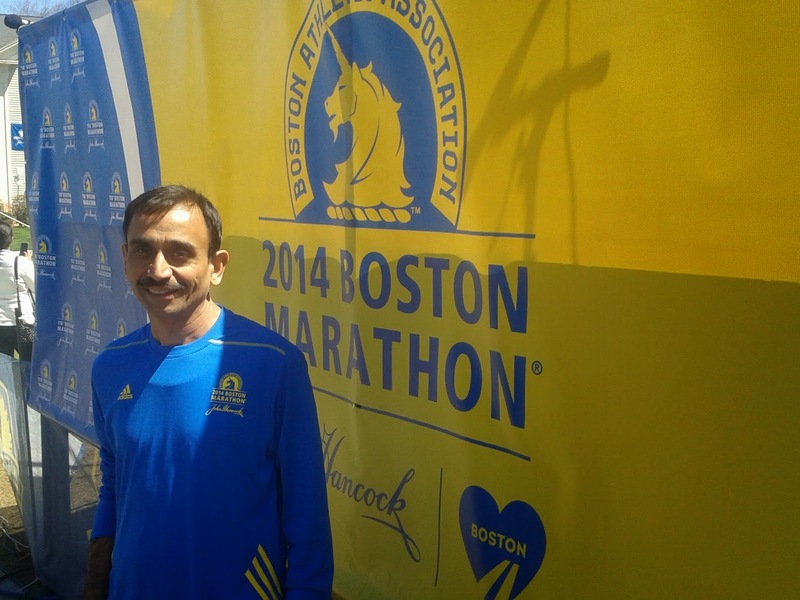 My cousin Shankar(who received me at Boston airport) and I reached the expo by about 11am. The bib pickup process was very quick even though I had to get a duplicate runner passport (mine was snail mailed to India in early April despite my changing the mailing address to CT in the last week of March). The expo was huge - have never seen anything like this before - all brands of shoes, running apparel, nutrition products and gadgets etc under one roof. Several talks/seminars and presence of celebrity runners such as 4 times winner Bill Rodgers, Dean Karnezes, Bart Yasso. Jeff Galloway etc meant that the John Haynes convention center was packed with visitors that Saturday morning. 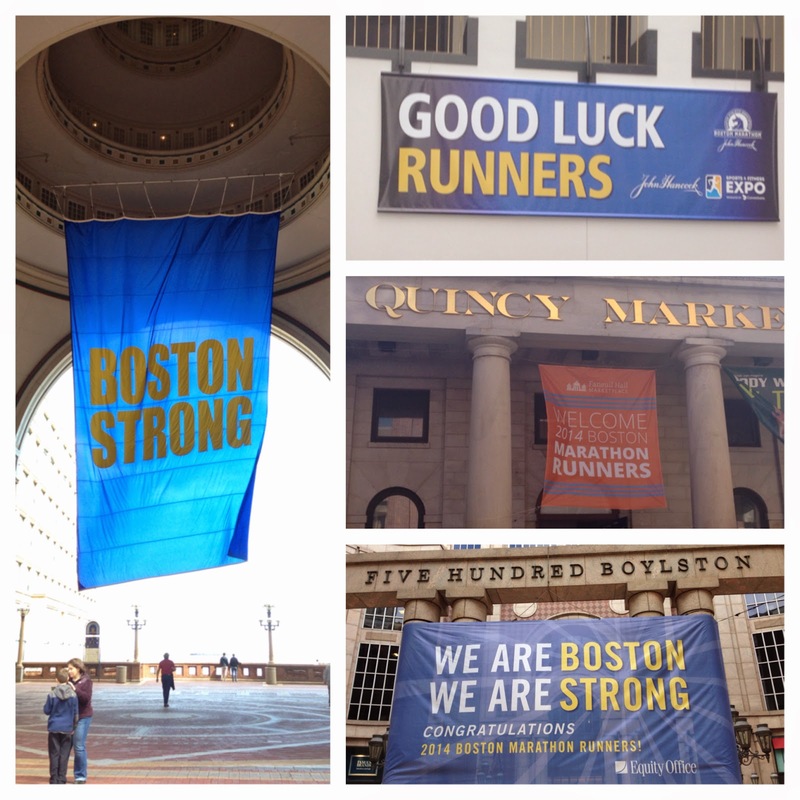 What little temptation I had soon melted away on seeing the huge queues to purchase Boston marathon branded merchandise. 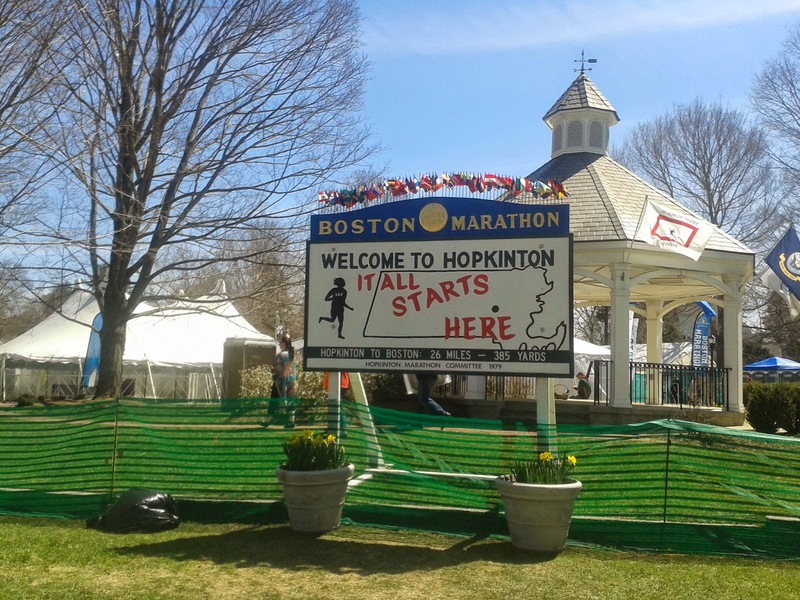 While BAA strongly recommended that all runners take their buses from Boston to the athletes village in Hopkinton my cousin and I felt it might be easier to get to Hopkinton on race morning and that would also give us an extra hour. So on Sunday, 20th morning we checked out the runners drop-off point, the athletes village and took some pictures of the start area - a cop was on duty directing traffic to enable people to stand at the starting line and be photographed. It was a gloriously sunny day with morning temperature around 10C and race morning was forecast to be similar. The folks at the information booth near the start area , sponsored by TCS, were quite helpful - based on their inputs we decided that I would be dropped off at the runners drop-off parking lot in Hopkinton between 830 and 845 am on race day morning. After some light stretching in the evening, laying out the gear for next morning and a fantastic pasta dinner at home(skipped the dinner organised by BAA in Boston) I went to sleep at about 1030 with the goal of waking up at 630am - the plan was to leave home around 745am. I felt quite good Sunday evening and based on the weather forecast of around 9C at 11am and 15/16C in Boston around 3 PM I decided not to carry my phone camera with me and try and race at least the first half. As usual I woke up a few minutes before the alarm went off. 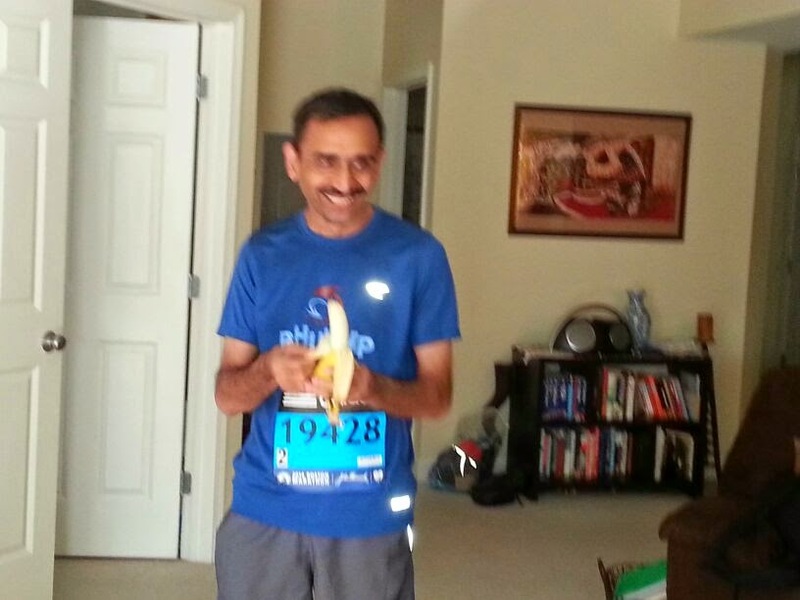 Had a couple of bananas and some nuts(almonds, pecans) and raisins and left home for Hopkinton around 750am. I had decided to run in a single layer half-sleeve shirt ; but wore two additional layers and a track paint to stay warm during the nearly 2 hours waiting period at the athletes village. When just a few minutes away from taking the exit off the highway to Hopkinton I realised that I had forgotten my Garmin at home and felt terrible.Being addicted to the Garmin I am unable to do well in long runs without one whether I am racing hard or not. And hence became terribly nervous and tense. Fortunately my sister was at home and was able to meet us halfway with the unit. Finally I was dropped off at the designated parking lot in Hopkinton around 920 am more than 30 minutes later than planned. Since the waiting time in the athletes village was going to be much shorter and it seemed quite warm I ditched my track pants and one layer of shirt in the car before getting off and joining the queue for the shuttle bus from the parking lot to the athletes village. I regretted the decision as I felt a little cold in the legs due to the breeze while waiting in the queue. However, the queue moved quite fast and after a security check(hand-held scanner and frisking) got into a bus around 940am. Got off at the athletes village ten minutes later and headed straight for the portaloos which had long queues despite there being hundreds of them. The village was crowded with runners relaxing/stretching/eating/chatting. By the time I came out of the loo at 1020am I heard the announcement for runners in Wave 3, corrals 1 to 3 to head towards the exit of the village and start walking to the race start point. 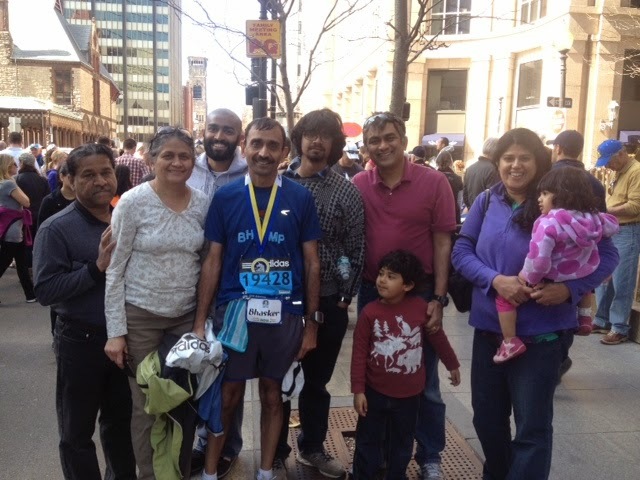 After discarding my full sleeves shirt(from NJ marathon of 2005) and walking towards the start point I bumped into Vaishali and Bhaskar Desai. Vaishali handed me the bib with my name and India colours on it which I quickly pinned below my official bib. Runners were then gradually separated out by their corral no. - I was in mine by 1045am with about 15 minutes left for start of the race. One thing that hit me as I warmed up was the high proportion of women in my corral. Another runner from San Diago with whom I was chatting remarked the same. The Wave 3 of the race started at 11am - I crossed the start line in about 55 seconds. Had to hold back during the descent of 120 ft to complete the 1st mile in 8:07. In fact the first 4 miles were flat or net downhill resulting in a much faster start than planned at 8:04,8:02 and 8:04 per mile. Though there were thousands of runners in each corral a few minutes after the race started there was enough room to run comfortably. In fact throughout the race I rarely felt cramped for race - unlike the experience I had at the only other race with 30,000+ runners that I have run- London 2007 - where I was elbow to elbow with other runners for pretty much the entire 26 miles.By this time one had run from Hopkinton to Ashland passing by a Lakshmi temple on the way. Miles 5 to 8 through the town of Framingham saw the pace drop to the 8:15 to 8:30 range (in line with the original plan) due to a couple of small rolling hills. 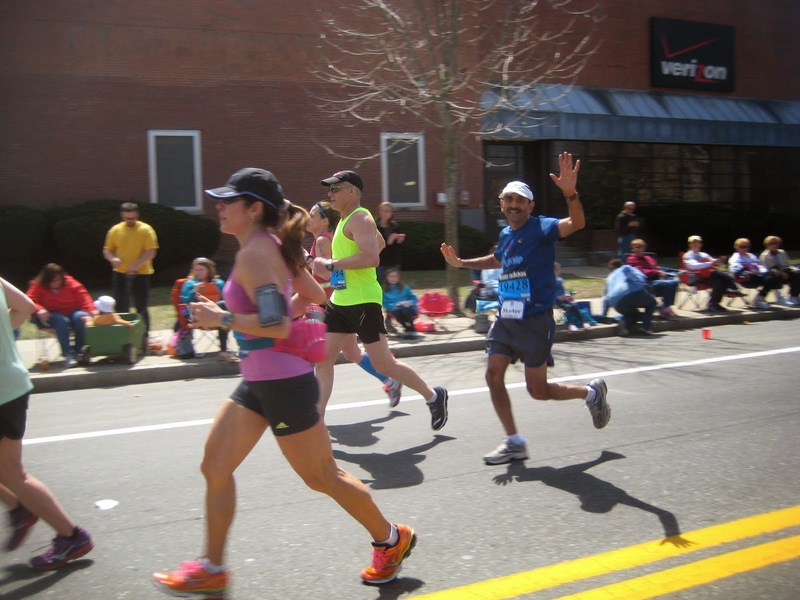 Miles 8 through 11 I kept the same steady pace through Natick where I was pleasantly surprised by ex-colleague Chai Rao calling out my name and taking a beautiful action photo. And then we ran into the famous screaming tunnel of Wellesley which lived up to its reputation. I tried to take in as many of the diverse placards as possible. The one that stood out for me is "Kiss me - I am performance enhancing". Since I was doing a decent pace I did not regret not carrying a camera. Stopping for a picture here, albeit for less than a minute, would have broken the momentum and perhaps slowed my finish time further. I reached the half way point in 1:49:11 at a decent average pace of 8:20 keeping alive hopes of a sub 3:45 finish. However, the pace dropped rapidly in the hills between Miles 15 to 22 through Newton as the iffy left leg started to act up. Though I had a gu gel each around the 15Km and 25Km I felt a bit hungry as well after 21 miles or so probably due to having eaten over 3.5 hours before the start of the race. I did not need to stop or walk but found it difficult to pickup pace even in the downhill portions. After about a mile and half through Brookline I saw the famous Citgo sign while entering Boston. However, there was another short but steep climb along the overpass atop the MA Turnpike. And even the wildly screaming, emotionally charged up crowds- many urging runners to claim the finish line this year- in the last 2 Kms leading up to the finish line did not help bring my pace to below 9 minute miles. The 5K splits below clearly depicts my fading after 25 Kms and the desperate need to be better prepared to run hills. The finish line camera shows me crossing the finish line at around 4:31 mark. While the timing was not great I thoroughly enjoyed the race. The weather was probably on the warmer side for most runners but it was perfect for me. I never felt hot throughout the race and did not sweat at all. I kept hydrating with water reasonably regularly - every 3 to 4 miles. There was an aid station with water and gatorade after every mile marker. And of course the field had some really strong runners. One of them running throughout with a small video camera strapped to his forehead stands out in my memory. 31,931 out of the 32,456 runners who started the race completed it! I finished 15,552 overall, 10074 out of 17,575 men and 813 out of 1778 in my age group. Despite being over 13 minutes slower than my qualifying time I finished nearly 4000 places ahead of my initial seeding of 19,428 (my bib no.). Each of the 8 towns had thousands of amazing spectators on both sides of the road cheering loudly. The crowd support in this marathon is supposed to be like none other and it lived up to the reputation with an estimated 1m spectators lined up along the race this year. The spectators displayed various signs and placards many of which kept me amused during the run. There were all the usual signs and many unique ones as well. Some that stood out are: 'Beer and cigarettes available here', 'I do marathons..on Netflix', 'slowdown runners - I am trying to count you all', 'WTF - where is the finish line'. 42 of the best ones are summarised here. After being draped in the thermal cape and the medal I grabbed a couple of cups of gatorade and headed over to the family meeting area thrilled to have crossed one off my bucked list!! Very proud of you Bhasker. Your determination and perseverance has paid off... Congrats once again! !